1) From Ao Nang to Railay by a long-tailed boat, about 15 minutes; 50-80 Bht/persons, with 8-10 persons is max capacity/boat, this destination is the most popular is due to less time, and shorter distance. In case you are Krabi Town, you can take a mini-bus to Ao Nang about 20 minutes. At Ao Nang beach, you can find a boat easily. 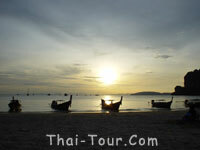 2) From Krabi Town to Chaofah Pier by a long-tailed boat, about 45 minutes, 80-100 Bht/persons. Longer distance/time, but more convenience if you are at Krabi Town. During rainy season, this route is not suite for travelers. 3) From Ao Nammao near Shell Fossil, also by a long-tailed boat, about 30 minutes. It is shorter for travelers to Railay East. This is alternative route during rainy season. from Bangko, along the Highway No.4 to Chumporn, the Highway No.41 through Langsuan(Chumporn), Chaiya, Suratthani, Viengsra, then on the Highway No.4035 to Ao Luk, then to Highway No.4 again to Krabi; 814 kms in total. (+662)434-5557-8 for non air-conditioned buses. (+662) 435-1199, 435-1200 for air-conditioned buses. From Bangkok to Trang or Thungsong (Nakornsithamarat), then take a mini-bus or cab to Krabi Town. Contact:(+662) 223-7010, 223-7020. 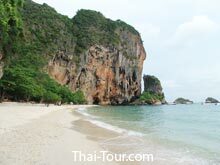 Starting at Phuket Airport or Krabi Airport, taking a cab to Ao Nang or Krabi Town. Contact Thai International Co., Ltd.: (+662) 280-0060, 628-2000.